Fiber Flux: An Easy Last Minute Gift...Wine Bottle Topper! An Easy Last Minute Gift...Wine Bottle Topper! I designed this Christmas Winer Bottle Topper for the good folks at All Free Crochet﻿ for their Stitch and Unwind blog. 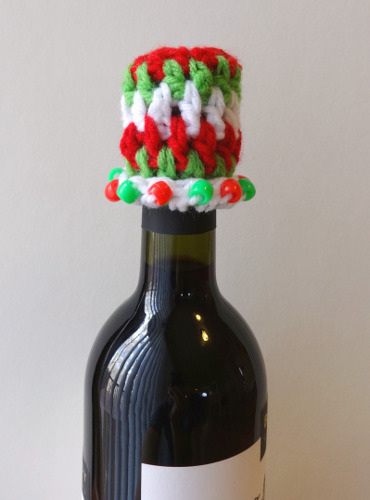 This is a super easy and pretties up a gift bottle of wine...all you need are some festive yarn scraps and a few beads. This is also a perfect project for all of that novelty/sparkly/sequined yarn you've been meaning to use up too! Get the free crochet pattern here! This is cute and rather novel!